Last night, the city of Melbourne opened its doors to creativity from dusk ‘til dawn as part of the 2016 White Night festivities. In only its fourth year, the White Night event transformed the city’s laneways, parks and public spaces with special lighting installations, exhibitions, musical and dance performances and more. The event, called Nuit Blanche in French, started in Paris in 2002, and has since inspired more than 20 cities around the world to host their own White Nights. Our Aussie friends had warned us that the streets get extremely crowded so to choose (wisely) the events you want to go to around the city. I thought I had a rough schedule figured out, but I was wrong. Nothing prepared us for the mayhem that we encountered. Well, the city wasn’t truly chaotic, but was filled with thousands and thousands of people. The entire CBD was shut down to traffic. We arrived late to the Balit Ngulu, a special aboriginal ceremony performed by the Wurundjeri, Boon Wurrung, Taungurung, Dja Dja Wurrung and the Wadawurrung people. I really wanted to see this traditional spiritual dance, but I couldn’t see ANYTHING and ended up watching through people’s mobile phones who were videotaping it all. Lesson learned: arrive early at White Night events if you want to see anything! The ceremony turned into a colorful, gorgeous light installation shown on the exterior of the Royal Exhibition Building in the Carlton Gardens. We stepped back from the crowds so we could enjoy the show. From there we wandered through the CBD and along the Yarra River to see the other events and light installations. We ended up walking at least 10km and arrived home about 2 a.m. Whew! We haven't been up this late since New Year's Eve! My only complaint is that there seemed to be a lack of enough events in the CBD, so you ended up walking a long ways before you found something. 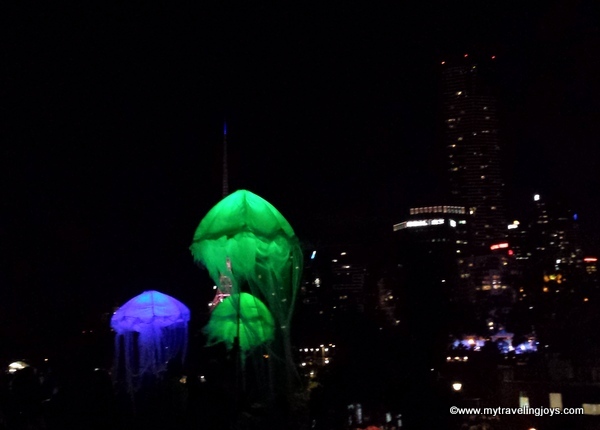 Illuminated Jellyfish floating by the city's skyline. “The Dresses” by French artist Tae Gon Kim featured three beautiful gowns made from hundreds of fibre-optic strands that changed colors. Just lovely! Food trucks near the Yarra River. Light installation on one of the laneways in Melbourne. A really good Spanish guitar player on the street. A giant Golden Monkey adorned the Melbourne Town Hall. For more reading: localnews report on White Night 2016. Have you ever been to White Night?